04/03/2019 The Deadwood Ditto is now posted. See Community Center page for 3rd Saturday details. 03/08/2019 See important message from Gerg Hertzback. March Deadwood Ditto. 03/08/2019 Third Saturday March 16th with Gumbo Groove. Don't forget about OPEN MIC night on odd Thursdays. See Ditto for more details. From the Deadwood Ditto...Spring Arts and Craft Fair at the Deadwood Community Center. Ashley Camacho will be hosting an arts and crafts fair at the community center on March 23, from 10 AM to 4 PM. Stop by to check out the talents of our local craftspeople. 02/05/2019 See Community Center page for 3rd Saturday details. 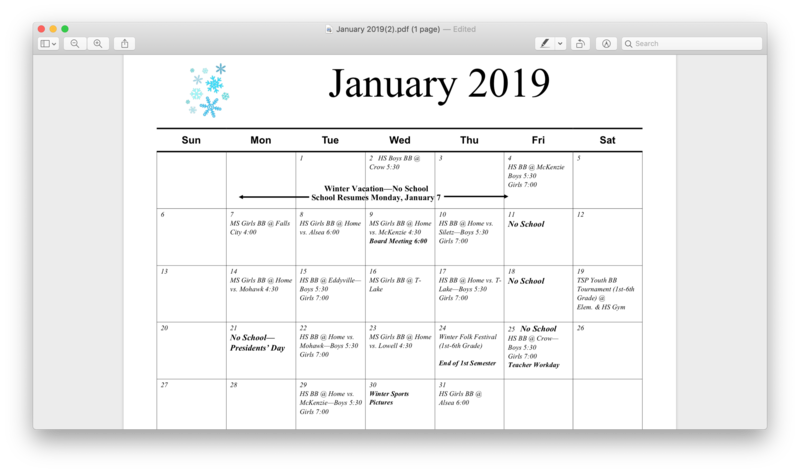 01/06/2019 Here is the Mapleton School Calendar for January 2019. 12/02/2018 The Ditto is posted. See Community Center page for Third Saturday info. 11/29/2018 Holiday Market this Saturday 12/1/2018. 11/1/2018 Third Saturday is 11/17/2018. See Community Center Page. 10/07/2018 Third Saturday is October 20th and the Deadwood Halloween Party is on the 27th. See the Deadwood Ditto for details. 09/12/2018 Third Saturday this weekend 9/15/2018. See Community Center page. Also, there will be a special dedication. Help make this a great occasion with your attendance. 07/03/2018 The Deadwood Ditto is now posted. 06/14/2018 See Community Center page for info on Third Saturday 06/16/2018. 5/19/2018 Deadwood Pioneer Cemetery invites you to the 4th annual Pioneer Heritage Day on Memorial Day, 5/28/2018, approx. 12:00 – 3:00 at the Cemetery. Potluck will start at noon; side dishes or desserts welcome – bring a dish to share &/or your donations to support your nonprofit community cemetery. Also bring a chair to stay and enjoy the presentation! This year’s event will be highlighted by the several local pioneer characters played by the John Quay Players, presenting pioneer life in this area. Enjoy the history, blooming flowers and shrubs in this lovely wooded setting. See the recent and upcoming improvements, including row markers and mapping, and the 36 new headstones marking previously unmarked graves, purchased with a grant from the Historic Cemeteries Division of Oregon Parks and Recreation. View the 11 black granite “art stones” that indicate unknown occupants of known graves. Honor our 34 veterans, including 2 Civil War veterans! Please contact us if you have questions or want to be involved – 541-964-3345 / 541-999-2209 / deadwoodcem@gmail.com. Thank you! 5/19/2018 Third Saturday with the Michael Anderson Trio. See more on community center page. 4/6/2018 Free Boat Safety Inspection 4/21/18. See Ditto for more info. 3/4/2018 Third Saturday - Kush Band. March 17th. See Music in Deadwood page. 2/21/2018 Third Saturday Events can be found in the Ditto and Community page. 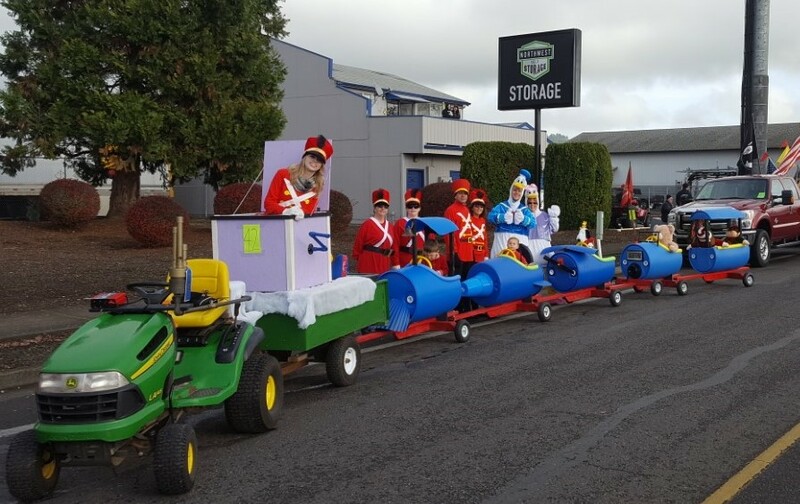 11/14/2017 This year I am participating in the Springfield Christmas Parade. I am entering my Barrel Train again. I am collecting Toys for the "Toys for Tots" program of Lane county. If you are interested in providing a new unwrapped toy for the parade I will deliver them to "Toys for Tots". If you have need, here is the link for Toys for Tots. The Parade is December 2nd so I will need them prior to that date. 11/9/2017 See Community Center page for Holiday Bazaar information. 11/8/2017 Kittens Need A Home ~ Three adorable kittens, who will grow up to be great mousers, are in need of a home. Two are long-haired. I can send pictures. Please phone: 541-535-5379. 10/09/2017 Please spread the word that at our store, Farmer's Country Hardware in Mapleton, we have yarn, fabric and sweatshirts. The yarns are of wool, wool blend, cotton and acrylic, all are $2.50 per skein regardless of fiber content. Fabric is by the fold, $2.50 each, as are the sweatshirts. Thank you! This is a limited supply. Must act fast. 09/21/2017 Volunteers are needed to help place headstones this Saturday 9/23/17 at Deadwood Pioneer Cemetery. More info here. 09/16/2017 Deadwood Fire - See News and Events page. 09/06/2017 Third Saturday is Sept. 16th. See the Ditto for more details. 09/01/2017 See the Deadwood Ditto for Community Events. 06/12/2017 Third Saturday June 17th with KUSH. 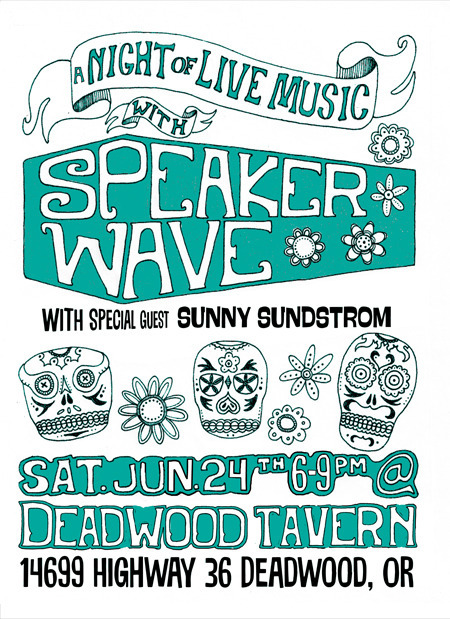 06/10/2017 Music at the Deadwood Tavern June 24th. Speaker Wave. 05/24/2017 Pioneer Heritage Day on Memorial Day at the Deadwood Pioneer Cemetery. 05/15/2017 Third Saturday is May 20th with Joanne Broh Band. 03/28/2017 Third Saturday is April 15th. See Community Center page for details. 03/26/2017 Go Fund Me account for... Deadwood Community Center is badly in need of a new hand rail around the deck. It has also been long discussed to provide a roof over the deck to protect the people and the building. We are far along with plans for a handsome new hand rail built into the roof supports for an industrial grade clear polycarbonate roof that provides rain and UV protection. We are also far along with fundraising but need your support with a little more to fill out our budget $7800. We have received a grant for $3.500 from Western lane Community Foundation, $ 2000 from DCS funds and raised almost $800 for 2 benefit events. With your contributions of up to $1500 we will reach our goal. Construction is due to begin in April and aims to be completed by May 19. The new hand rail is necessary for safety and the roof over the deck will a boon to the community creating extended dry space during rainy season events and our popular Third Saturdays. Hundreds of people will benefit for decades to come. 02/10/2017 Deadwood Talent Show, this Saturday February 11. 6.30pm, Call Billy Burress 964 3555 for details. Featuring local performers, desert concession table, and introducing the Silent Auction fundraiser. Biding on these items will be completed on Third Saturday. 02/06/2017 Our band booked for Feb 3rd Saturday cancelled on us just before Kate left for a two week trip to Kenya. On the other hand, we have been working up definitive plans for replacing the rotten hand railing of the Community Center and at the same time build the long awaited roof over the deck. We are expecting a grant from Western Lane Community Foundation but need to raise a further funds for this much needed project. To this end, we are creating a Night in India Fundraiser: Dinner with a slide show, time to chat, meet and greet neighbors, silent auction and some music. See poster below. As always, there will be menu options to suit all needs and organic ingredients. Postings of a variety of silent auction items to come. 12/31/2016 Happy New Year. See Third Saturday info on Community Center Page. 12/16/2016 See Community Center page for activities. 10/28/2016 Presentation November 3rd. See info on Community Center Page. 10/13/2016 Third Saturday is canceled due to bad weather. 09/17/2016 See the Community Center page for local events. 08/24/2016 Event at the Community Center on September 10th. We encourage you to come camp for the weekend and bring your families, friends, and cash donations to help with party costs!! PLEASE ABSOLUTELY NO DOGS ALLOWED!!!!!!!!! ***we lost all of our party gear in the fire so please bring any you have to donate or loan such as lights, tables, tablecloths, plates, cups, silverware, fabrics, pop up tents, chairs, and anything else you find fitting!!! 07/08/2016 The Deadwood Tavern is hosting live music on the last Saturday of July and August. See the Ditto for more information. 07/01/2016 The Farmers Market is open 10:00 to 2:00 pm each Saturday during the summer in the Post Office parking lot. The Swisshome dump is on the chopping block. See the Ditto for more information. 06/14/2016 Third Saturday is June 18th. See Community Center page. 05/23/2016 Please join us at Noon on Memorial Day, Monday, 5/30/2016 - Hear about Civil War and Oregon history. David Burkett of the Sons of the Union Veterans of the Civil War, and Tami Dreiling will provide pioneer reenactments and storytelling, and Ken Sawyer will bring his Civil War and Indian memorabilia. Bring a chair and some friends, and enjoy Civil War History near the river in a park-like setting. Bathrooms will be available to public. Free food - hot dogs, chili, cookies and bottled water will be supplied... potluck salads or desserts if you wish. Verizon cell service, coffee, and other necessities are available at the local restaurant/tavern, the Deadwood Country Market and Tavern. We hope you can join us! 05/17/2016 Open Board Position. See details on Community Center Page. 05/09/2016 Rhody Weekend music can be enjoyed at the Deadwood Country Market featuring Steel Wool Band starting at 5:00 pm and Peter Giri and Friends at the Community Center with music at 7:30 pm. 04/01/2016 Work on the cemetery today and again on May 14, 2016. Info here. 03/27/2016 Need funding for your small business? Here is a great funding source. 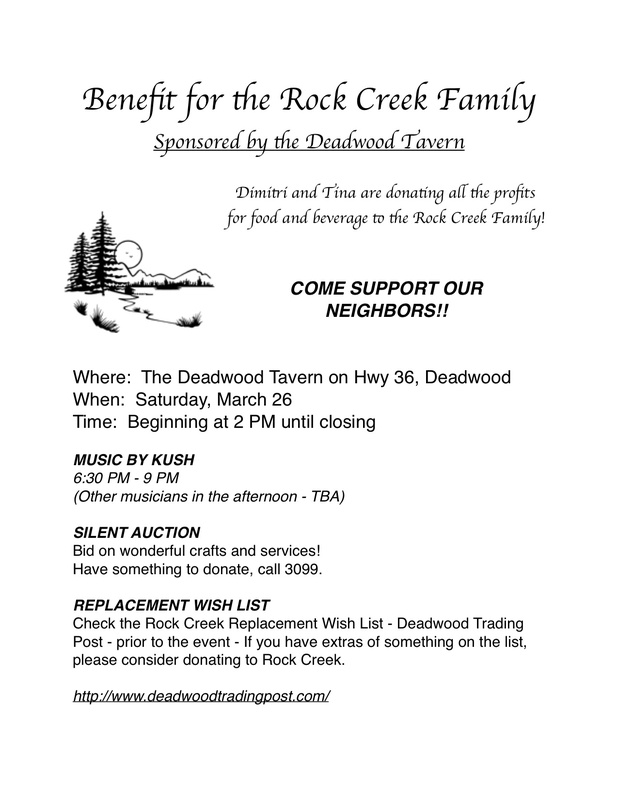 03/10/2016 Fund raiser for Rock Creek on March 26 at the Deadwood Tavern. See more information in the Deadwood Ditto. I am writing in regard to a submission in the March Ditto about content and your editorial reply. First, I want to thank you for all the years of service and inclusion of EVERYONE in Deadwood. Personally, I find the Ditto well balanced. I have had the opportunity, and the burden, of deciding what to include in the Deadwood Trading Post. I find that your editorial skills are purposely neutral. I for one do not find the Christian Dogma offensive nor do I feel it is rammed down my throat. I have discovered that some who suggest they are philosophically inclusive are easily offended by people that do not agree with them. I thought this was Deadwood, “where diversity lives”. I appreciate your hard work and dedication to Deadwood and the Ditto. 02/24/2016 There was a good turn out for the School Bond Meeting. Bottom Line, the tax per property is estimated to be $1.59 per 1000 of value up to almost $2.00 (for the $5 million bond). Calculating the lessor of the two ($4 million bond) this is $159.00 per year on $100,000 home, $238 for a home valued at $150,000, and $477 for a $300,000 property. The bond is 25 years so the estimate will be $3975.00 to $11925.00 depending on assessed value and amount of the bond. Facebook (Deadwood Outreach Group) has some good discussion on this topic. 02/22/2016 This Tuesday, 6:00-7:30 PM, at the Deadwood Community Center, Mapleton School District is hosting a public information and comment meeting to discuss the facilities bond that will be on the ballot for the District in the May election. The meeting will include information on facilities needs and a discussion of potential improvements, as well as information on how the bond would affect taxpayers. Hope to see you there, as there is a lot to talk about! 02/10/2016 The Ditto is posted and full of great information. Deadwood Ditto. 02/04/2016 Third Saturday February 20, 2016. See Community Center page. 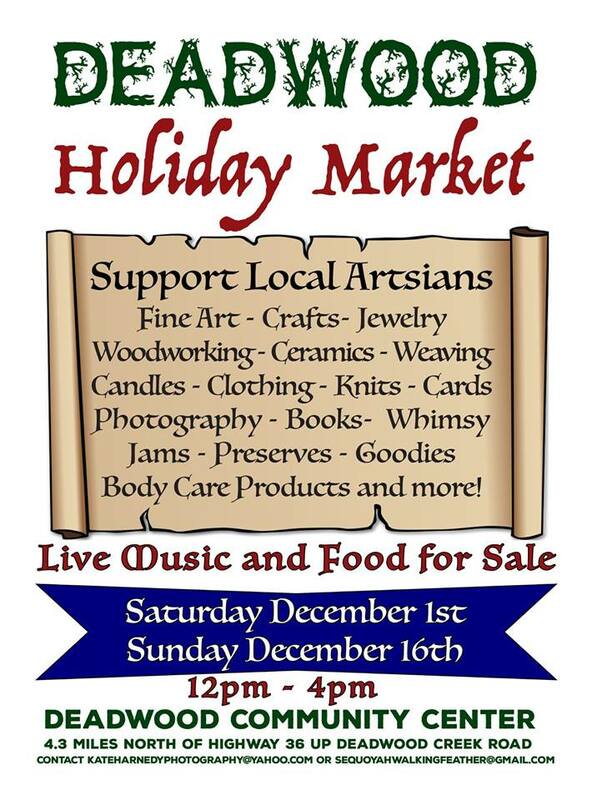 12/04/2015 See Community Center Page for information on the Holiday Market and Third Saturday. 10/14/2015 This Sunday there will be a clean up day at the Deadwood Cemetery. Information. 10/06/2015 Upcoming meeting/Event on 10/11/15 and Third Saturday on the 17th. See Community Page. 10/4/2015 See information on the Community Center Page. Meeting on 10/21/15. 6/4/2015 The Farmers Markets opens this weekend, June 7th. See Farmers Market page. 5/16/2015 May 25th, Memorial Day, the Deadwood Pioneer Cemetery is hosting a Heritage Day. Food will be served at noon with activities to follow. See April Ditto for more information. 5/13/2015 Third Saturday is May 16th. See link above for more information. 04/22/2015 Special Meeting May 21st to discuss changes to DCS bylaws. See information on Community Center Page. 04/20/2015 The next Third Saturday is May 16th. See link above. 04/08/2015 Third Saturday is April 18th. See link above. 03/19/2015 In case you missed it...here is the article from the February Issue of the Ruralite, "Living a Simple Life in Deadwood". 02/22/2015 The next board meeting will be held Thursday, March 12th, from 7-9 pm. This is an open meeting, and all are welcome to attend. Call Tchanan at 5031 for info on location and directions. 02/08/2015 See the Neighborhood Watch page for Scam Information from the Sheriff's Office. 01/11/2015 Below is Steve's address courtesy of Keith. 01/05/2015 Meeting minutes for the Annual DCSB on the Community Center page. 12/15/2014 See Siuslaw Watershed page for news release about FREE native plants. 12/6/2014 The Deadwood Community Services board of directors (DCS) is having a meeting Monday, Dec. 8th at 6:30 at the community center. The purpose of the meeting is to discuss ideas for the maintenance and improvement of the Community Center, and to make budget/financial information available, and to address any concerns that weren't heard at the Annual Meeting. All are welcome to attend and give input. 11/10/2014 The DCS Annual Meeting was informative, lively, and well attended. In the essence of time I kept my presentation short so I will take this opportunity to outline a few talking points. The Deadwood Trading Post continues to get over a 1000 pages views per month or 15,000 per year. While this doesn't represent a huge following it isn't bad for our small community of Deadwood. Eighty percent of webpage visits originate in the U.S. However, we continue to draw activity from 28 plus countries. Brazil was second to the U.S. and represented 7.4% of total views. Within the U.S. the top 5 states visiting the Deadwood Trading Post include; Oregon, Washington, California, New York, and New Jersey. Commerce isn't as strong as I would like but one particular artist has had regular activity and some great sales. If you have input or would like to make a submission please use the contact us link on toolbar at right. I attempt to respond promptly but I work 5 days a week in Florence so my time is limited. Depending on my schedule, I complete updates within the week, often within 24 hours. 10/04/2014 DCS Annual Meeting - Sunday November 9th. Potluck at 5:00 p.m., Meeting at 6:00 p.m.
10/02/2014 Third Saturday is 10/18/2014. See link above. 06/04/2014 The Deadwood Microloan Committee is prepared to accept applications for startup money for persons trying to start or enhance a local business or increase income potential. Loans can be made in the range of $50 to $250 with terms of 1% simple annual interest. To set up an appointment, ask for more information, or request a simple application call Mel at 964-3223 or Keith at 964-3502. Or you can e-mail Mel at mgurtov@aol.com or Keith at keithst@pcez.com. An application can be found on the Business Directory page. Suggestions for projects are: sewing / equipment, transport service to and from Eugene and Florence, small engine repair, dog / pet sitting, goat / milk, home security, or make other suggestions. Any of several persons on the committee will be available for making this happen. 05/16/204 Community Center Work Party and bar-be-queue pot luck Sunday June 1st 10am-3pm. Bring your garden tools, rakes, clippers, weed eaters etc. and make beauty and the Community Center. We will also re-fresh and cleanse inside the hall for our greater pleasure. Contact Mary at 541 964 5341 for any questions. 05/14/2014 Another scam. Please read. 04/30/2014 PUBLIC SERVICE POST. Deadwood is home to many artists and authors. I feel that you should be aware of a scam. I listed a product from the Deadwood Trading Post on Craig’s List. A perspective buyer sent me a $3700.00 bank check for a $1800.00 item. With a little research I discovered that the sender of the check, Publish America, LLLP, is a scam. See attached links and decide for yourself. 04/07/2014 May Day Run. See April Ditto. 04/06/2014 Third Saturday for April...See link above or the Community Center page. 03/01/2014 Blachly Lane is making some By-Law changes. Be sure to review you next bill and ballot carefully. Here is the website for more information. 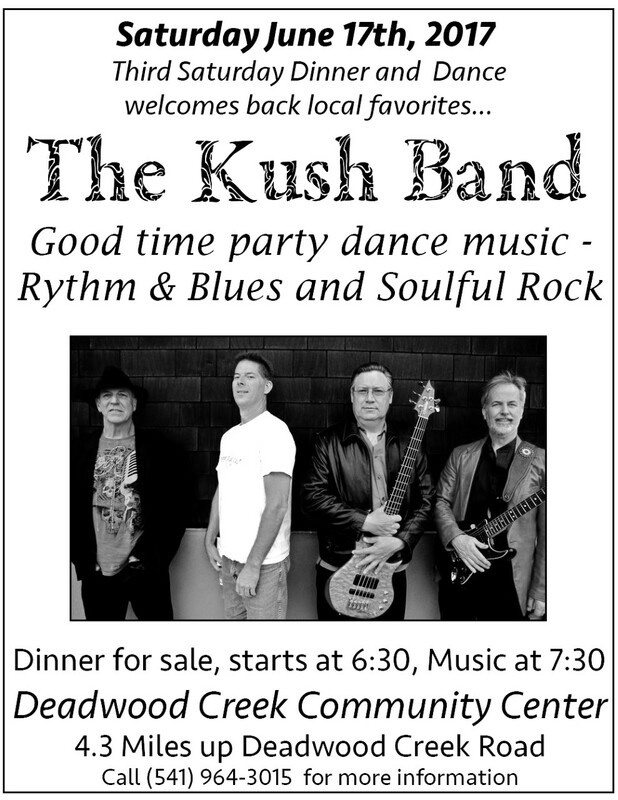 02/10/2014 The Kush Band will playing at the Community Center this month. 01/03/2014 The Deadwood Country Market has now opened their Tavern. The Tavern also serves food so stop in and enjoy a hamburger, your favorite beverage, and watch a little football on the big screen. 12/02/2013 Third Saturday 12/21/2013. See Community Center page for details. 11/27/2013 The Deadwood Trading Post wishes everyone a Happy Thanksgiving. 11/14/2013 Holiday Bazaar Sunday December 1st. See flier here. 11/7/2013 The Deadwood Creek Services Annual Board Meeting is Sunday 11/10/2013. See more info on the Community Center page. 10/21/2013 Important Meeting at the Deadwood Community Center, Tuesday, 10/22/2013 at 6:00 p.m. New Post Office hours will be discussed. The meeting will start promptly at 6:00 p.m. Read more information here. 10/07/2013 Jim Estes, a founder of Alpha Farm, passed away Saturday morning, relatively peacefully. All of the close family members nearby had been to visit him in the past two days, and those who couldn’t travel to him were able to talk to him by phone. Even though he couldn’t speak, we could see responsiveness in his face. For his last two days he was surrounded by loved ones. Thank you to all who came to visit or sent messages of love and prayer. He appreciated every one. Thank you, Jim, for your loyalty, devotion and 41 years of selfless service to Alpha Farm. We love you and miss you! Jim will be buried at the Alpha Farm cemetery in Deadwood at 1 p.m. tomorrow, Tuesday, October 8. For information on the exact location and where to park, call Lysbeth at 541-344-8984 (home) or 541-510-1540 (cell), or call the farm at 541-964-5102. We are still working out the details and timing of a memorial service and will post these as soon as we know. It will most likely be the weekend of October 19-20 or 26-27. Thank you all for holding Jim and Caroline in the light. 10/02/2013 Third Saturday Event with Sol Seed is on October 19th. See link above. 09/29/2013 The bears are prowling Deadwood again. Time to get your apples picked before the bears destroy your tress. See Deadwood's Most Wanted here. 09/13/2013 Third Saturday Returns for the Fall. See link above. 08/09/2013 The Annual Rock Creek Reunion Party Gathering is August 16-18. See information here. 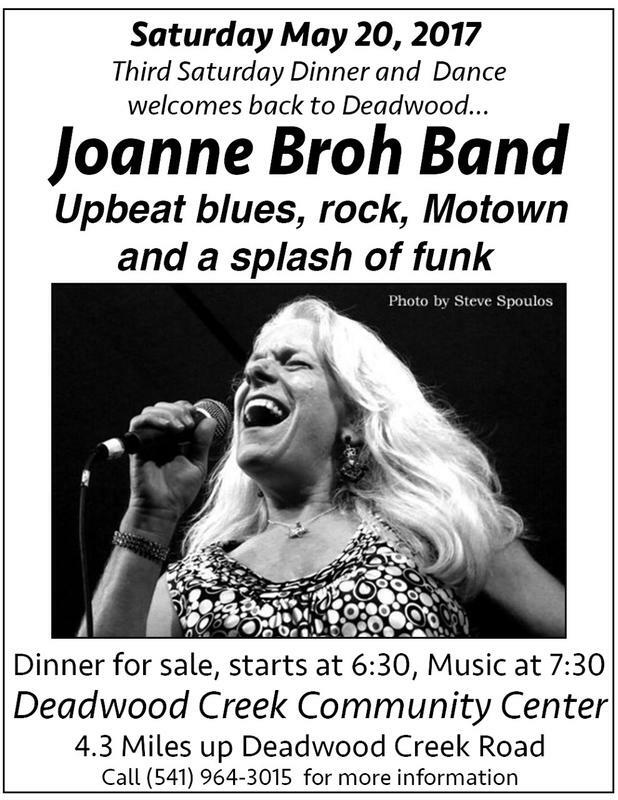 07/04/2013 The Deadwood Community Center is sponsoring a special Third Saturday in July. See link above. 06/18/2013 As most of you know by now, Blachly Lane is having a special election between Cheryl Haskell and Clint Kokkeler. The ballot you received in the mail includes an insert that outlines both candidates background and message. Read it here. You have already made the difficult decision before the previous election. This one ought to be easy. A supporter of Clint Kokkeler stated, "I think with [Clint] having a business back ground maybe we can get changes made to restore Blachly Lane back to the old concept which was to provide lowest cost power and maintain the integrity of the coop". Below is a submission by Maggie Oldershaw in support of Cheryl Haskell. ​Regarding the Blachly Lane Electric Co-op election, please DON'T SHOOT THE MESSENGER BECAUSE YOU DON'T LIKE THE MESSAGE!! Cheryl Haskell is a dedicated board member and deserves to be re-elected to her position. Her opponent may make a great candidate IN THE FUTURE but currently has a lot to learn about the BLEC. Cheryl has worked hard on behalf of members and has accumulated a great deal of knowledge along the way. I have known Cheryl since the early days of the anti-merger campaign and believe her boundless energy is a great asset. She deserves to be re-elected. VOTE CHERYL HASKELL. 06/15/2013 A few updates: The June 2013 Ditto is posted, Third Saturday is upon us, and Max and Eva Edleson is teaching a workshop on how to Build a Wood Fired Barrel Oven August 17-18th. See link for information. 05/27/2013 Third Saturday is June 15th. See link above for details. 05/26/2/2013 Mapleton farmers' market update: for those who may be interested, looking at the last Saturday of June to begin the farmers' market in front and around our store, "Farmer's Country Hardware", 10:00 a.m. - 2:00 p.m. Anyone interested feel free to give us a call at 541-268-4005 or just come on by, we're open Mon - Sat 9:00 a.m. - 6:30 p.m. Hope to see you there! Thank you. 05/17/2013 The Deadwood Country Market is celebrating Rhody weekend with a BBQ and a Beer Garden. ​Friday through Sunday 12:00 p.m. to 7:00 p.m. Revelers will complete their evening at the Community Center for Third Saturday Music. See link above. 05/06/2013 I have been approach again about posting election information. I do not want to burden you or this website with election propaganda, but I will pass along a spattering of hopefully useful tools for making an election decision. Here is a website for a few candidates running for the Port of Siuslaw. I have considered joining the Swisshome-Deadwood volunteer fire department. When reviewing the ballot, I noticed an open position, Director Position 1, which is uncontested. It is a 2 year unexpired term and requires a write-in candidate. I will run for that position as a write-in candidate. That is Karl Logan, Karl with a "K". My Background - I have no experience with a Fire Department or Fire Fighting, but I have extensive experience using fire. In fact, when I was 17, I caught on fire and didn't like it. I am a full time Respiratory Therapist at Peace Harbor Hospital and your local Deadwood Trading Post Administrator. I have a Degree in Respiratory Therapy and a BA in Healthcare Administration. I have lived in Deadwood since 1999. I am asking for your vote. Please support the Mapleton School District and the local candidates running for the Board. 05/05/2013 Today is the beginning of FIRE AWARENESS WEEK. Here is a public service announcement of your local volunteer fire department. PLEASE DO NOT UNDER-ESTIMATE THE CURRENT DEGREE OF FIRE DANGER!!!!!! THE STATE FIRE BOYS SAY IT IS NOW AS DRY AS A TYPICAL AUGUST. PREDICTIONS ARE FOR HIGH TEMPERATURES AND WINDS. ALWAYS BE PREPARED WITH A WATER SOURCE AND FIRE EXTINGUISHERS. 05/03/2013 Several updates to report. The Neighborhood Watch and Third Saturday information has been posted. Also, the May Day Fun Run is this Sunday followed by a pancake breakfast and a plant exchange at the Deadwood Community Center. 04/29/2013 Nancy Nichols of Deadwood would like to throw her support behind the incumbent for Blachly Lane. Here are a few words from Nancy. I am supporting Cheryl Haskell for Blachly Lane Electric Co-op District 3 position. Over the last couple years I attended a number of Blachly Lane meetings concerning an opportunity for the Blachly Lane Electric Co-op to partner with Siuslaw Watershed Council and others to underground power-lines on West Fork Road as part of a project to improve salmon runs. The project was grant funded so there was no cost to the co-op. The project would save money on brush clearing and reduce power outages caused by trees falling into the lines. Some of the board members were caught up in old grudges and voted against the project. Cheryl worked to understand the actual issues and vote for the best interest of co-op members. The problems on the Blachly-Lane Board do not rest with Cheryl Haskell who is the newest board member. She should not be voted out for the failures of others. 04/26/2013 The Blachly Lane Election for Board of Directors is underway. If you are like me, you have noticed electric rates sky rocketing. Maybe it is time for a new Board. I have been asked to pass along information on one such member running for a seat on the Board. Clint Kokkeler makes some great points about out electric rates and the way decisions are made that affect all of us. See info here. 04/05/2013 Check out the classified...free pool table. 03/28/2013 Third Saturday is April 20th. See Link above. 03/09/2013 Third Saturday is fast approaching (March 16th). See link above. 02/19/2013 Mary Lou wants everyone to know she would enjoy helping Deadwood residents with their quilting and/or patchwork needs. The only requirement is that you come to her home. She will volunteer her time. Your company is payment enough. Call Mary Lou at her home. She is on the tree. 02/08/2013 Third Saturday is approaching fast. February 16th. See link above. More information regarding the upcoming meeting * here *. Great background information. See pdf for more information * link here *. Everyone has noticed the Lake Creek Ridge logging by now. The clear cut is quite evident as you turn on to Deadwood Creek Road. The next cut will involve cables across Deadwood Creek Road between the cemetery and Boyd's home. See more information and contact person on the Lake Creek Ridge Logging page. 12/16/2012 I have created an interactive forum "Deadwood Creek Forum" for posting messages. It is similar to the classified message board so it should be easy to use once you have mastered that board. 12/15/2012 They have a large hound with a GPS tracking device on him at the Deadwood post office. Pretty hungry. Maybe you could put the word out on your magical email network? Eric S.
Post a reply on the Deadwood Creek Forum. 11/24/2012 The Deadwood Country Store is now open for business. Visit the Country Store page for more information. ​December 1, 2012 from 10:00 a.m. to 4:00 p.m. at the community center. Please tell a friend. 10/27/2027 Deadwood Creek Services Annual Meeting, November 4th, 5:30 potluck, 6:30 meeting. To find out more about what is going on in Deadwood now (as well as connect with your wonderful neighbors) plan on attending the DCS Annual Meeting on Sunday, November 4th. A potluck will begin at 5:30 and the meeting begins at 6:30. Bring your thoughts, ideas and visions. We hope to see you there! Third Saturday Event November 17th. See link above. 10/24/2012 The Deadwood Store has new owners. See more information on Country Market. Another note to spread is for visitors to Jim. He gets lonely. He also has become quite the sweet eater so if anyone bakes cookies or brownies and happen to have a few extra, Jim’s is the place to leave them! 10/22/2012 A message from Les B. and the R.O.P. See Post office link at top of page. I know most of you read the Deadwood Ditto in it's original paper format, however, I was recently asked to update the Deadwood Ditto webpage. The Deadwood Ditto webpage is now current through September. I got several months behind on scanning due to frustrations with my scanner. My scanner is so slow...how slow is it? My scanner is so slow I can drive to Florence and back between pages. Having said that, if anyone is interested in scanning the Deadwood Ditto and forwarding it to me I will gladly post it promptly. I will get the October Deadwood Ditto posted soon. Help our community/our kids! To make a donation to the booster club's auction of goods or services call Richie at 541 964-5621. Conjugal Visitors Return to Deadwood !!! Saturday, September 15, 2012 Info posted on the Community Center Page or use the Third Saturday link above. See 8/28/12 meeting information on the Deadwood Creek Community Center Page. ROCK CREEK PARTY / REUNION 2012 - PARTY UPDATE !!!!! Friday will be a work day and setting up for the masses ( all help welcome!) with some sort of meal in the evening and possible musical jam session...dj's whatever y'all bring!!!! Saturday evening POTLUCK around 7:00 followed by our favorite musical guests....KUSH!!! We LOVE being able to make this event possible with all of your kind help!!! Your donations are greatly appreciated!!!!! SEE YA SOON AT RC !!!!! The mystery of the knight in shining armor has been shoved. Jane and her family stopped at the Farmer's Market and met Nancy, Cathy B, Margie, Helen, Opal, Lucie, Billie, Kaki, Jan, and Ray. Ray is the knight in shining armor. He rescued the damsel in distress (and her family). An update from Jan, apparently Jane and her family were headed to the Country Fair and their GPS lead them to the Deadwood Store for gas. The GPS didn't know the store was closed. So I guess GPS isn't so smart after all. I would like to express my extreme gratitude to the wonderful people I met at the market last week. I was so nervous about being without gas - we literally had gone well past the flashing light on the dash and the alarm noise to let us know we were nearly dry. You were so warm and helpful and the gas you gave us got us to the next station safely - then on to the fair for a wonderful day. I hope your children had a wonderful time in Japan, and your beautiful granddaughters have a great summer in your amazing countryside. I am sorry I don't recall the name of the lovely man that went back to his farm for the gas - but thank you! Elaine and Jesse Pattison are going to have cases of fresh picked Organic Oranges for sale by the case next month and They want to see who would like to pre-purchase. I stumbled on an article that discusses how to tighten up your computer to block tracking cookies and other unwanted intrusion on your private life through your computer. Below are the highlights. In Firefox it's called Private Browsing. There's an Incognito mode extension for Chrome. This article tells you how to switch any tab to Incognito with one click and here's information for using Incognito for specific sites. Internet Explorer has an In-Private browsing feature, as well as offers a way for people to selectively block sites from tracking. Apple has had private browsing since OS X Lion. A few updates for the community. 1) The dinner and music at the Community Center last night was great. A big thank you to Tchanan for arranging the music and to Nancy for the great food. 2) Next weekend is the big Hwy 36 Garage Sale. Great opportunity to sell a few unwanted items or some crafts. 3) The Farmers Market begins next weekend as well. I am creating a Farmers Market/UDIG/local produce page. Please provide some feedback and information for the webpage. It is already on the toolbar under Farmers Market. 4) I spoke with some Deadwood residents that inquired about Ride Sharing. As a reminder, I created a post in the classified that can be used for this purpose. Please take another look at it and create a post if you are interested in Ride Sharing. Maybe someone will want to share the trip to Eugene or Florence and conserve some fuel. It will be good for the planet, good for your pocketbook, and provide some good fellowship. The classified section allows you and others to post information without my involvement, and that is good for everyone. Please note that the Hwy 36 Garage sale is June 22, 23, 24. Not June 29, 30 and July 1 as printed in the Ditto. Thanks Deb for the heads up. The last Third Saturday for the season is June 16th. See link above. Surf on over to the Classified Ads for new listings. Now listed...Cedar Garden Boxes. They can also be found on the new webpage - Deadwood Marketplace. The Deadwood Calendar has a typo...31 actually. August starts on the wrong day of the week and that error follows for the rest of the month. So, do not make plans based on the August Calendar. My understanding is that another August page is being drafted. 5/9/2012 The Deadwood Post Office is Saved See post office update link at top of page. The Cinco De Mayo celebration was a good time. The band was great. Thanks Sunni. Next on the Community Center Agenda is the May Day Run (today), then Third Saturday. Surf over to the Community Center Page for updates and celebrations. Updates include: Thanks for the help with the Community Center Clean-up, Cinco De Mayo celebration, and Third Saturday in May. Don't forget the May Day Run, May 6th. See post below. Senate Bill 1789 referred to as the “21st Century Postal Service Act of 2012" is sponsored by Senators Lieberman, Carper, Collins, and Brown. The Senate is voting as early as Tuesday. The bill could change the current course of the Post Office Closures. See link below. Time for spring cleaning! Come and pitch in at the Deadwood Community Center Clean-up. Bring yourself, a tool of your choice, something to grill and a potluck dish to the Community Center at 4:00 p.m. on Friday, April 27th. Weeding, brush piling, pruning, constructing, scrubbing, planting, overseeing, entertaining……there will be something for everyone! Yippee! May Day Run! Yahoo! Come take a run, a walk, a ride or a gander at the May Day Run this Sunday, May 6th, at the Deadwood Community Center (4.3 miles up Deadwood Creek Road). This wonderful annual event will begin at 10:00 a.m. with a “race” around the Deadwood Creek Loop and through the Deadwood covered bridge. Then everyone is treated to a wonderful pancake breakfast and a chance to win raffle prizes donated by local artists and craftspeople. This is a very family-friendly event—the more the merrier! give Mizu a call at 541.964.3981. 04/12/2012 Post office update see link above. No doubt most of you have received two (2) notifications regarding the herbicide/pesticide testing. If you are like me, you are a bit puzzled by the two letters. One suggests everything was fine and the other said the opposite. So which is it? For the answer you it will require some homework then you can make a decision for yourself. Here is my brief analysis. Both are technically correct. In reference to the August 2011 testing, neither atrazine or it's metabolites were detectable and neither source refute those findings. 2,4-D is the herbicide in question. As noted in one letter, 59 of 64 samples or 93% of those tested were in fact positive and the level of 2,4-D is higher than that of the average population in the United States. However, as the other letter points out, government guidelines suggest that the participants were not exposed to 2,4-D at levels that are expected to cause adverse health effects. The question is what YOU consider to be an acceptable level of 2,4-D. The letter you received provided information on the dangers. There have been some interesting updates regarding the Post Office. Here is a link to an article from the Statesman Journal. Even money-losing rural post offices must stay open, Merkley says. The Rural Organizing Project has also been very active. See the articles in the attachments on the toolbar on the right. Also, see the letter below from Les B. Great information. Read More...See Link Post Office update at top of page. Third Saturday is upon us once again. March 17th marks the date for the Saint Patrick's Day event. The Raven Tones & Steel Wool will rock the house (or in this case the community center). Dinner starts and 6:30 and music starts at 7:30. Feel free to download and print the flier and pass it along to your friends. 02/25/2012 I have responded to this ‘spin release’ from Senator Wyden’s office... See Post Office updates link at top of page. Wyden Statement on Proposed Closure of Mail Processing Facilities in Bend, Pendleton, Eugene and Salem...Read more... See Post Office update link at top of page. Haley from Blachly Lane Coop is coming out on Thursday, February 23rd and will be at the Post Office at 11:30 to take some pictures and get comments from citizens about how closing the post office will affect them. She will be writing an article for the Ruralite. This will be a great opportunity to be heard. The recent Triangle Lake meeting was covered by KEZI see it here. It is a short article but highlights residents concerns about spraying on forest land. If you live in the "defined recruitment area" you should receive a notice titled "The Highway 36 Pesticide Exposure Investigation". The minutes from the February 13th Think Tank meeting at the Deadwood Creek Communiuty Center are still pending. 22 concerned residents attended the meeting. Additional information can be read at www.rop.org. 02/11/2012 3rd Saturday Event at Deadwood Creek Community Center Feb. 18th. Deadwood Community Center...Read more... See Post Office update link at top of page. Thank You Karl for the January Flood photo's. There is a community organizing meeting in the works and a notice will be coming soon. The process to secure the meeting center is in process. In the interim the following article is well worth reading. Pictures of the flood in Deadwood are at the following link. 01/10/2012 Post Office Update - See link at top of page. 01/03/2012 Post Office Update - Town Hall Meeting...Read More...See Link at top of page. Communities. Their efforts will continue in 2012.
them on his blog very soon. Here Is A Preview of what he will post on the web site: You All Earned This. Thank You All, On Behalf Of Our Committee and the ROP Staff. 12/15/2011 Post Office Update - See link at top of page. 12/12/2011 Post Office Update - See link at top of page. The following was sent out to supportive groups across the state today. Jessica and the ROP staff want each one of you to know how thankful they are for your support of Keeping Our Rural Post Offices Open. Jessica had also attached the letter (.pdf) of support which was attached to the information sent from Senator Wydens Office. I did not duplicate the attachments. It is Good News - this is a great way to begin preparing for another chance to give input into the process. Being State wide is good -- there are 40 communities that share our concerns. County Commissioners from all over have come to the support of keeping the rural post offices open. If you happen to see any of them (i.e. Jay Bozevich) thank them. Jay also sent the good news out to all of us. Thank You commissioner Bozievich. Mr. B. on behalf of our Communities -- including Walton (Notified by Jessica). Hello fellow Post Office defenders! My name is Jessica Campbell and I am an organizer with the Rural Organizing Project. We are working with Leslie Benscoter of Deadwood and Otan Logi of Swisshome--whom you may have already talked with--to save rural post offices in Oregon! Our first action is to do a friendly Occupy Our Post Office day on Monday, December 19th where we will deliver Christmas cards and cookies to our Postmasters and postal employees to show how much we care about our Post Office! We will also be collecting signatures, cards, and letters to our Senators and Representatives asking them to save rural post offices by imposing a 6-month moratorium on closures and to support legislation that allows the Postal Service to operate efficiently! I have good news to share! Senators Wyden and Merkley both have signed onto a letter calling for a 6-month moratorium! The letter now has 20 signatories and seems to be growing by the minute! The letter and resolution are attached. Are you getting ready to participate on December 19? Have you gotten your Christmas cards to your Postmaster and postal employees picked out? Remember that ROP staff are excited and available to help you organize for December 19! Just send us an email or give us a call! This was sent to all of us from Senator Wydens Office (Today). Juine attended our first community meeting and has been working very hard to keep not only us but Senator Wyden appraised about our concerns. Our efforts do make a difference. Lets keep focused on the task at hand -- the Dec 19th Occupy Our Post Office is supportive of the 6 month moratorium and better legislation. There are attachments, I hope that is ok with everyone. It is prudent to ask everyone to make the effort to inform those who do not have an Internet connection or are not on this mailing list. It would be neat if we had a decent showing of folks on Dec 19th to sign the petition in support of the moratorium. (Reminder): The planning meeting in the Deadwood Creek Community Center is Monday, Dec 12th at 7PM. We are sending out a second letter this evening with more supportive information from the Rural Organization Project. The ROP staff have been instrumental in taking this project state wide. Keeping everyone informed is a huge task which requires a great effort. I have attached the letter and legislative language asking for a 6-month moratorium to prevent the postal service from closing or consolidating area mail processing facilities or rural post offices. The letter is signed by 20 Senators (Sanders, Ben Nelson, Tim Johnson, Mark Udall, Bennet, Klobuchar, Tester, McCaskill, Baucus, Landrieu, Begich, Rockefeller, Wyden, Gillibrand, Leahy, Merkley, Harkin, Franken, Kerry, and Tom Udall). A recent notice from the Postal Authorities posted in our Post Office tells us that we have 87 rented boxes and 109 on the rural route. Those figures are close to 200 to tell us something: Get the word out to everyone - many in our community do not have email. Communications are vital to saving our rural post office. A State wide effort is being made to involve all 40 rural post offices for an Occupy The Post Office for Monday December 19th. It is time to start getting ourselves organized for the statewide action! There is a good chance that the media will cover this event. Let's meet at the Deadwood Creek Community Center at 7PM on Monday, December 12 to make sure we are ready! * Getting the word out in the Ditto. Thank You. me. Mr, B.
the WELL KNOWN LOCAL FAVORITE BAND OF CHOWDER BLUES AND BREWS! "Third Saturday" series and we welcome them back. Craft Fair at the Deadwood Community Center Saturday, 11/26/2011 from 10:00 am to 4:00 pm. Art, pottery, jewelry and other handmade craft items will be available for sale to the general public. This is a great opportunity to support your local community. The November 3rd Saturday Event was fantastic. Forty to fifty residents celebrated with music, dinner and dance. Brian Chevalier and The Westside Players performed late into the evening. The atmosphere was jubilant and the music and incredible. A great time was had by all. See you next time. Don't miss the 3rd Saturday Event (Nov. 19th) at the Deadwood Creek Community Center. A night of Music, Dinner, and Dance. Dinner starts at 6:30. Music starts at 7:30. Brian Chevalier and The Westside Players perform Blues, Soul, and Rock. For more information call - 541-964-5031 Cost - sliding scale donation. Following the Deadwood Community Meeting and update on the Post Office, I was reminded to purchase stamps from the Deadwood Post Office. The Post Office gets their revenue from local stamp purchases and postage originating from the Deadwood location. If the Deadwood location is saved, we can support our post office with shipping revenue and increased commerce using the Deadwood Trading Post. The Deadwood Community meeting will be held at the Deadwood Community Center on Sunday, 11/13/2011. Potluck at 5:00 followed by the meeting at 6:30. Don't forget to write to congress folks and postal management about them closing our Post Office. It really would be a shame to lose 50% of our community. A great website - I enjoyed the visit.